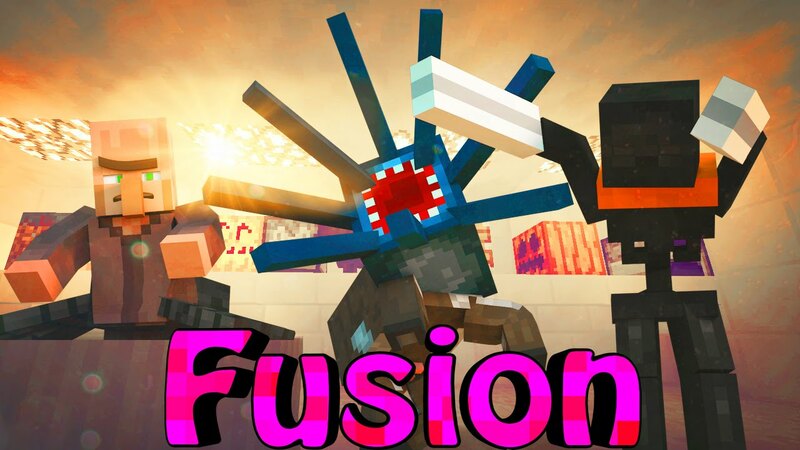 Fusion Mod 1.12.2/1.11.2 is the alloy addon for SimpleCore/Simple Ores. It adds steel (and steel items) and the fusion furnace (an alloy furnace) by itself. 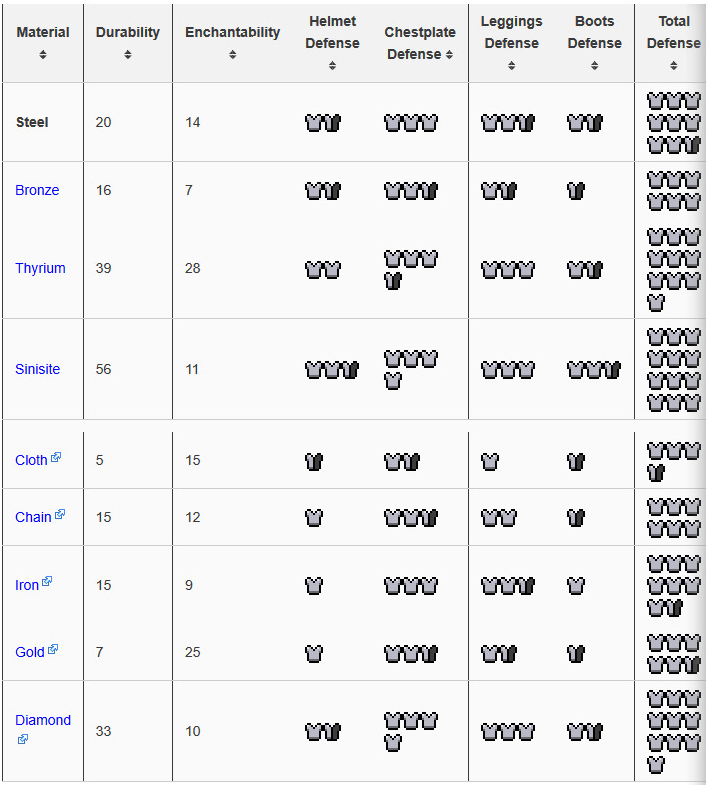 If you also have Simple Ores, Fusion Mod adds 3 more alloys and items made from them: Bronze, Thyrium and Sinisite. Steel Chunks are the results of putting an Iron Ingot and Coal together in a Fusion Furnace. Depending on the catalyst used, a different level of chunk is produced. There are small, medium and large chunks. 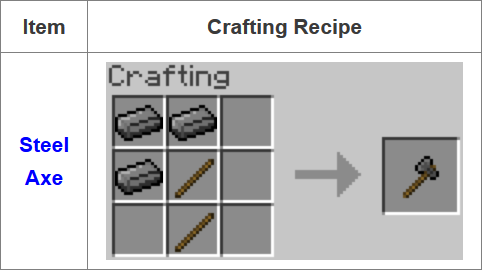 They can be made into a Steel Ingot, which can be used for tools, armor, etc. To produce a Small Steel Chunk, a piece of Coal must be used as the catalyst. The small chunk is the most inefficient way to produce the alloy, as five small chunks are required to produce an ingot. 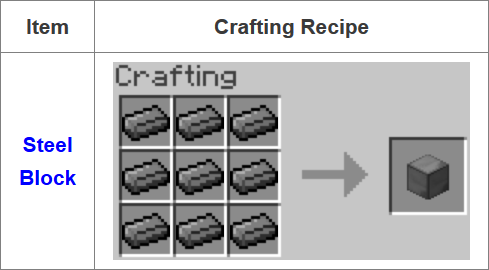 Five small chunks can be crafted into a large chunk, which can then be smelted to produce a Steel Ingot. 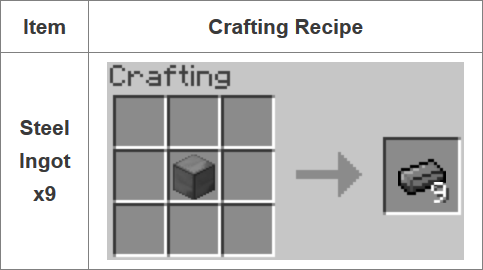 The following recipe is shapeless, so the ingredients can be placed anywhere on the grid. 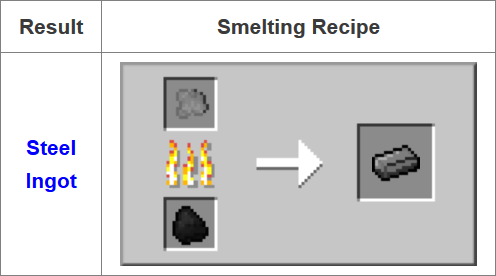 To produce a Medium Steel Chunk, a piece of Gunpowder must be used as the catalyst. 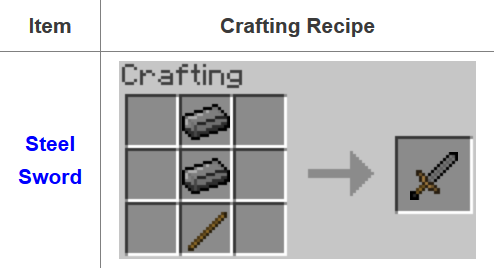 The medium chunk is a more efficient way to produce the alloy than creating small chunks, but less efficient than creating a large chunk. 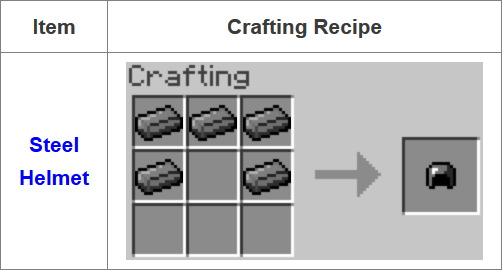 It requires three medium chunks to produce an ingot. Three medium chunks can be crafted into a large chunk, which can then be smelted to produce a Steel Ingot. 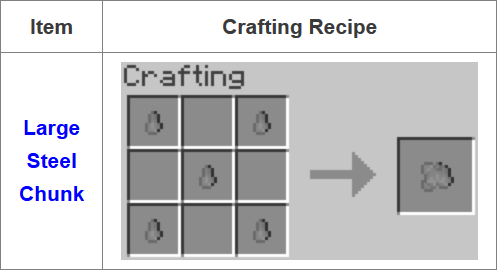 The following recipe is shapeless, so the ingredients can be placed anywhere on the grid. 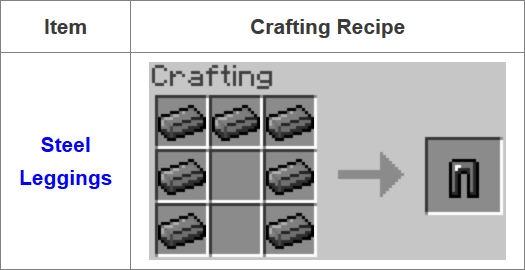 To produce a Large Steel Chunk, a piece of Redstone must be used as the catalyst. The large chunk is the most efficient way to produce the alloy, as a single large chunk will produce an ingot when smelted in a furnace. When a Large Steel Chunk is smelted in a furnace, it produces a Steel Ingot. 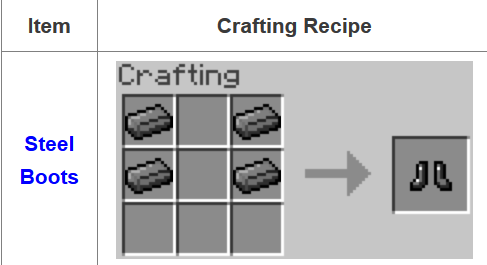 Steel Blocks are decorative mineral blocks made from Steel Ingots which do not appear in normally generated maps anywhere. They can be made by placing 9 Steel Ingots in a crafting grid. 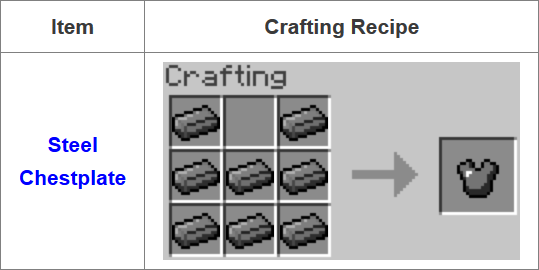 This is a convenient way to store large amounts of ingots, as they can be recovered by placing the block in a crafting grid, receiving all 9 ingots in return. Steel Tools are tools made from Steel Ingots. These tools are the first tier of tools made from an alloy, and so the Fusion Furnace must be used. 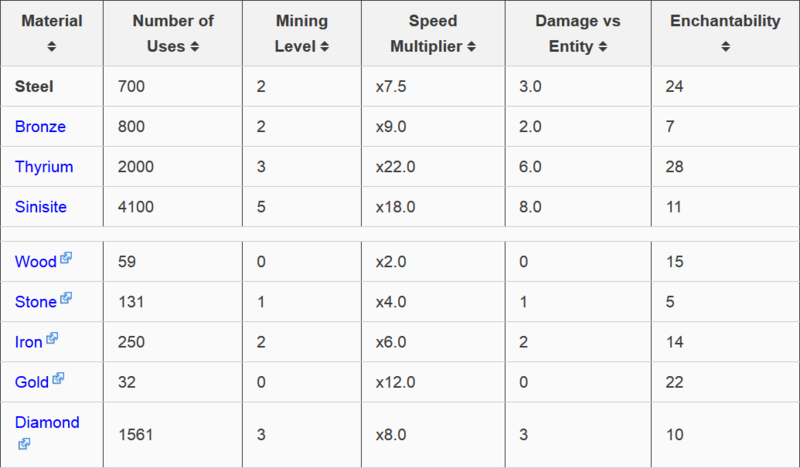 They have a similar number of uses to Mythril Tools and are more enchantable, however they are slightly slower. The Steel Axe is used for breaking wood-type blocks, such as logs, planks, crafting tables, etc. It can also be used as a weapon, dealing half a heart less damage than a Steel Sword. Steel Pickaxes are used to mine ores and many other types of blocks. 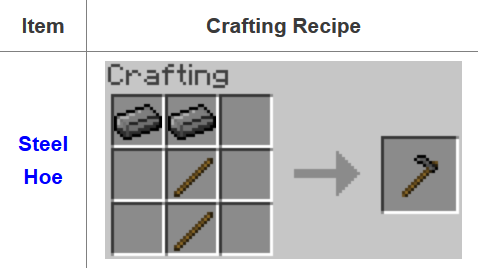 The Steel Pickaxe can mine the same blocks as an Iron Pickaxe, meaning they are able to mine all blocks except Obsidian. A Steel Shovel can be used to speed up the collection of dirt, sand, gravel, clay and snow. It can also be used to collect snowballs from snow. The Steel Hoe can be used to till dirt and grass blocks into farmland, which can be used for growing crops. Using a Steel Hoe to break blocks will not use durability, however it will take just as long as if you were not using any tool at all. 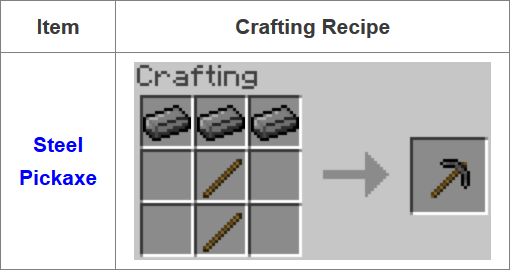 Steel Swords are craftable weapons that can be used to damage mobs or other players. They can also block attacks with the Right Click, and can be used to destroy certain blocks such as cobwebs. Steel Armor is armor made from Steel Ingots. It is superior to Iron but weaker than Mythril Armor. It is the first alloy armor added by the Fusion Plugin, and so the Fusion Furnace must be used. It offers protection against damage, depending on how many pieces are equipped.